Bio: Lois Gold grew up in New York, where she still resides, and studied languages at Boston University. While earning a Master's Degree in French at Columbia, she started sculpting at night and later took a water color class. 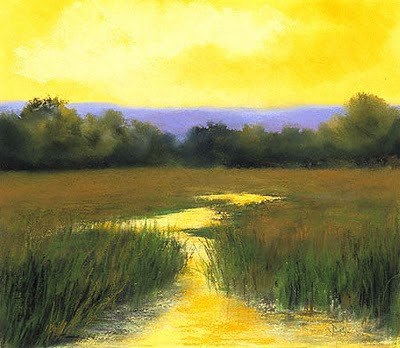 What started out as a hobby soon turned into a career, and along the way, she discovered her medium of choice - pastel. Style: Realistic to imaginative, but always representational. Her painting, Venetian Light, visible on the exhibitions page (dateline 4.2.2010) does for pastel what Turner did for watercolour. Navigation: Main menu remains available. Very easy site to negotiate, well laid out and logical. Gallery: Treescapes; Landscapes 1, 2, 3. Image View: Each gallery page contains thumbnails which enlarge in pop-up window. Thumbnails detail size and medium, as do enlargements. Download permitted. Marshland is 450x351, 53 KB. I couldn’t resist this painting, partly because of the association with the artist’s name, partly because of my memory of Sennacherib (“The Assyrian came down like a wolf on the fold/and his cohorts were gleaming in purple and gold”).